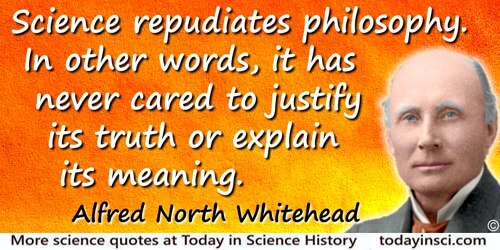 English mathematician and philosopher who worked in logic, physics, and later in his life spent more time on the philosophy of science and metaphysics. 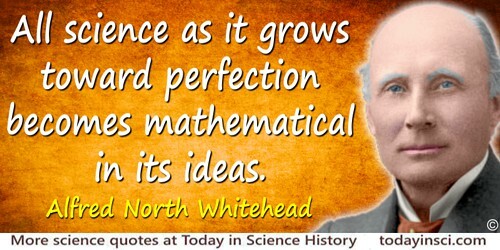 He worked with Bertrand Russell on Principia Mathematica which shows that logic underlies all mathematics. 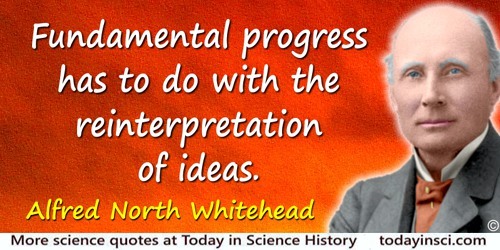 Fundamental progress has to do with the reinterpretation of ideas. 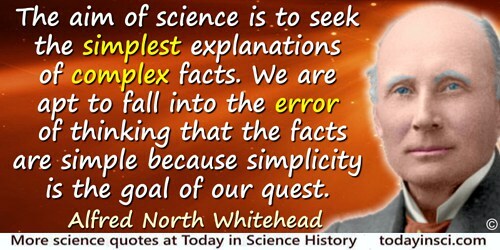 In Science and Philosophy (1948), 228. 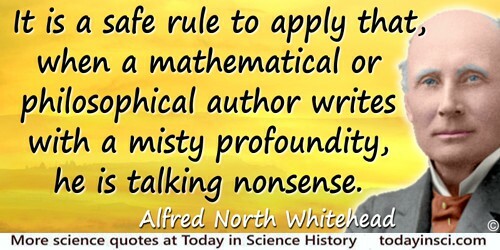 It is a safe rule to apply that, when a mathematical or philosophical author writes with a misty profoundity, he is talking nonsense. In An Introduction to Mathematics (1911), 227. 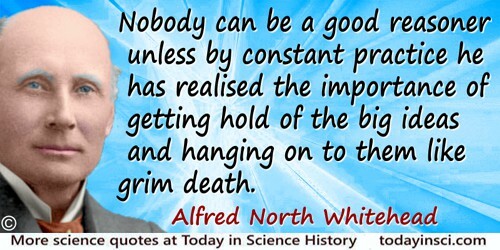 Moral education is impossible apart from the habitual vision of greatness. 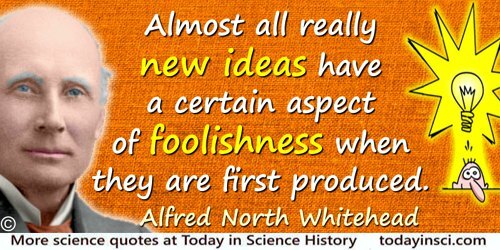 As quoted in a number of sources, but usually without further citation, for example, in Wordsworth Dictionary of Quotations (1998), 459. Webmaster so far cannot confirm, so if you know the primary source, please make contact. 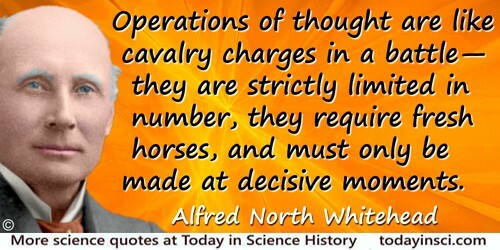 People make the mistake of talking about “natural laws.” There are no natural laws. There are only temporary habits of nature. 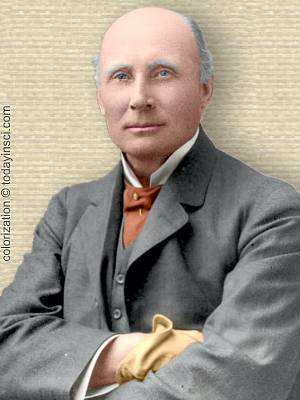 In Alfred North Whitehead and ‎Lucien Price (ed. 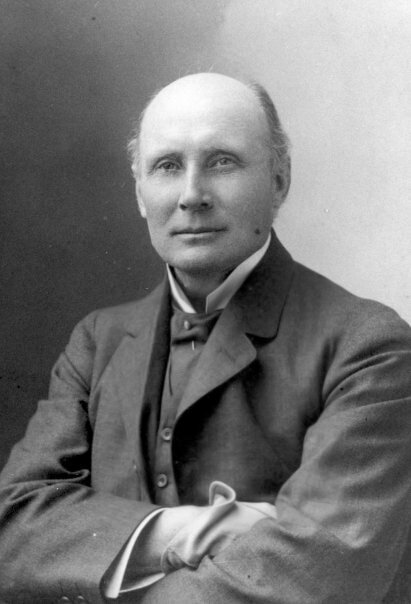 ), Dialogues of Alfred North Whitehead (1954), 267. Philosophy asks the simple question, What is it all about? In 'Remarks: Analysis of Meaning', The Philosophical Review (Mar 1937), 46, No. 2, 178. Collected in Barbara MacKinnon, American Philosophy: A Historical Anthology (1985), 406. 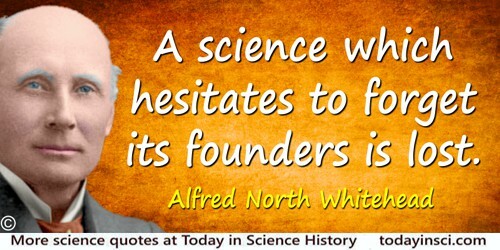 The laws of physics are the decrees of fate. 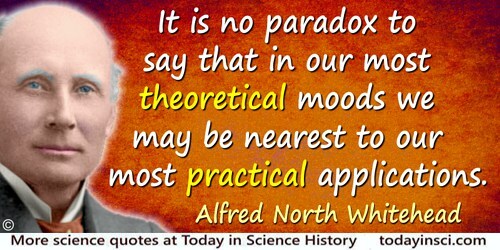 In Science and the Modern World (1926), 13. 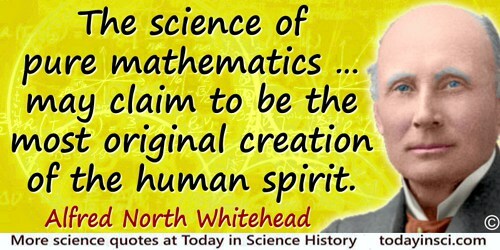 The originality of mathematics consists in the fact that in mathematical science connections between things are exhibited which, apart from the agency of human reason, are extremely unobvious. 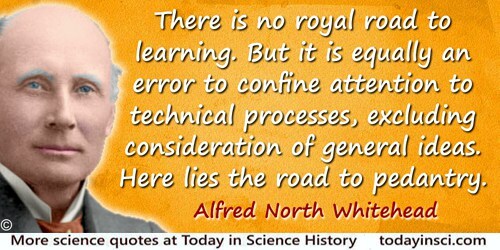 In Science and the Modern World (1938), 32. 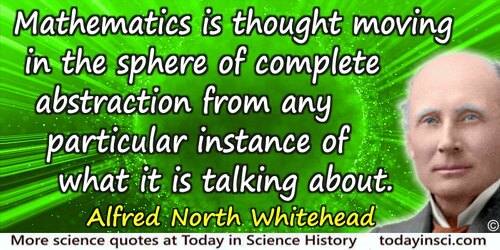 The science [of mathematics] has grown to such vast proportion that probably no living mathematician can claim to have achieved its mastery as a whole. In An Introduction to Mathematics (1911), 262. 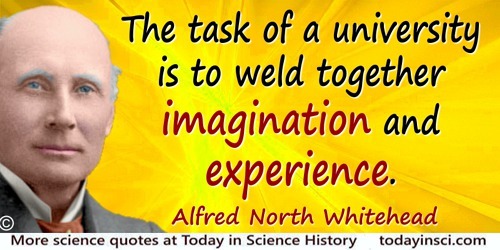 The task of a university is to weld together imagination and experience. 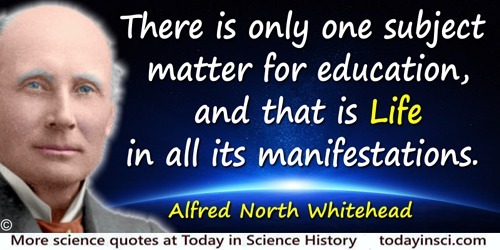 In 'Universities and Their Function', Aims of Education: & Other Essays (1917), 140. The tragedy of the world is that those who are imaginative have but slight experience, and those who are experienced have feeble imaginations. 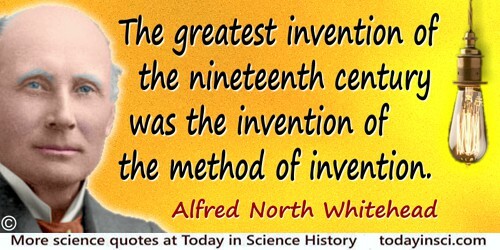 Fools act on imagination without knowledge, pedants act on knowledge without imagination. In The Concept of Nature (1920), 61. 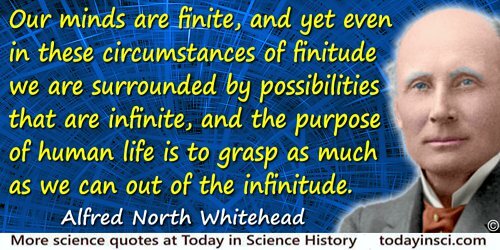 Whitehead repeats this in Nature and Life (1934, 2012), 48, intriduced with: “Since there are no instants, conceived as simple primary entities,…”. In "An Appeal to Sanity' (Mar 1939). 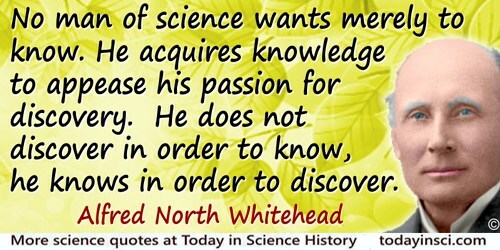 Collected in Science and Philosophy (1948), 83. 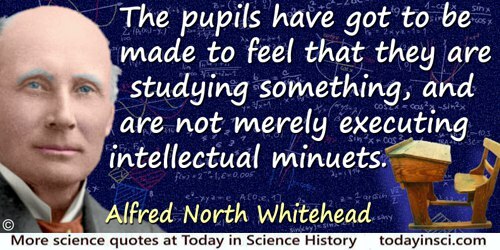 15 Feb - short biography, births, deaths and events on date of Whitehead's birth.